This is a wrap around skirt and I haven’t worn one in such a long time. I tied the bow in the back and then pinned it to the skirt so that it would stay tied. Otherwise, if the bow came undone then that could have left me in a really awkward and embarrassing situation haha It’s so cute though I love it. 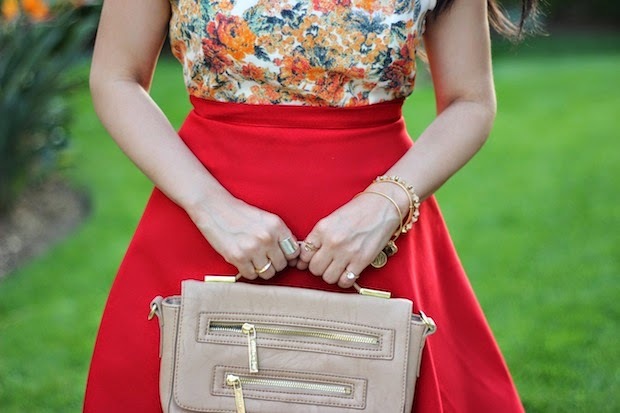 And red is such a fun color to style. I found this top a few days before my trip. I almost didn’t get it but I’m happy that I did because it worked perfectly with this skirt. It’s actually a crop top but it was long enough on me that I could tuck it inside. I love the floral print because it has a vintage feel. El rojo siempre te queda divino! You look very elegant and bright, I like how your red skirt compliments your gorgeous black hair! Cute and lady-like! You also look great in red! I am really liking the flower print trend.